Recently i've been using a BBQ lighter to do some precompliance ESD testing on my prototypes. The lighter i've been using is battery powered. I removed the cover and replaced it with some electrical tape. Underneath the cover it has a earthing wire I've connected this to a piece of solder that i place near the electrode, I've also added a flywire to the earthing wire so I can connect it to an alligator lead or direct to PCB for testing. It has been interesting watching this thing in action. The sparks can jump 0805 components quite easily. I've put ESD diodes to protect some mosfets and inputs and so far the AVR or the protected components have not missed a beat. Previous tests on unprotected mosfets shows they don't stand a chance. 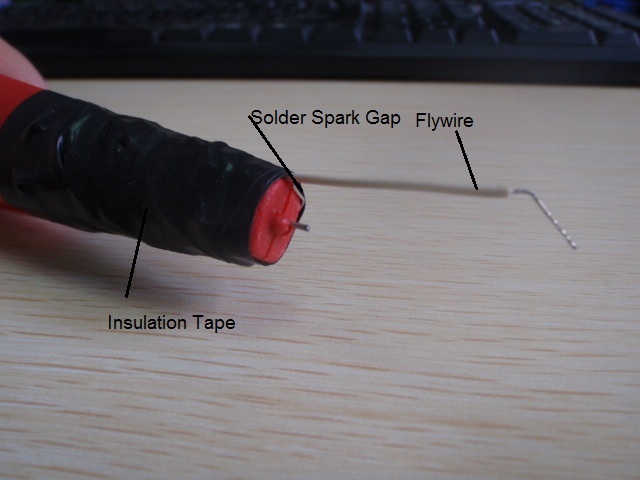 Take note of the solder spark gap. Without this you run the risk of having the boost transformer's insulation breakdown (speaking from experience). No idea of the voltages I'm creating, but so far its been a good way to do some precompliance checking. You should be able to estimate the voltage from the length of the discharge, I'm sure I've seen a formula somewhere. You'll need to make some assumptions, of course. Here is a similar design used for EMI testing http://www.emcesd.com/tt2004/tt0... Some other experiments are interesting, too. You're doing some pretty nasty testing! I've heard of some automotive specs that require direct discharge to the conductors but most specs only require discharge to exposed surfaces. Dry air has a dielectric strength of 3e6V/m. So an arc length of n meters would correspond to 3e6*n V, or about 30kV/cm. That's assuming dry air of course. I used a very similar setup for a number of years. It was quite effective and led us to some pretty robust designs. They passed CE!